If you work with us, you know we do not push products we don’t believe in. If we haven’t tried it, used it, or received positive feedback about it we don’t sell it. Sage ACT! E-marketing is one that if you aren’t using it, you probably should. Almost daily we receive questions about how to send e-mail campaigns. Without dredging too deeply into why you shouldn’t just blast out of Outlook, skipping the soap box speech on CAN-SPAM rules, and glossing over putting yourself at risk of being black listed, (all very direct hints that those are bad things) we thought we’d point out a great utility that’s literally built into ACT! – ACT! E-marketing. If you send out newsletters, announcements, or just regularly scheduled touch base e-mails, you really need this add-on. You see Sage ACT! E-marketing every time you open ACT! and likely don’t even realize it. It’s that button in the toolbar with the fluffy little cloud behind it. There is also data dropped right in your database if you subscribe to ACT! E-marketing. That is the tab you probably click on and immediately close because you don’t know what that dialog box is that splashes your screen. ACT! E-marketing is a safe way to send out glossy, professional e-mails. Because it is powered by Swiftpage, it includes web reports and tools that help you hone your e-marketing based on real results. You can track open rates, manage opt-outs, all those things you need to know to be a nimble e-marketer. You should check it out. Free, live demos of Sage ACT! E-marketing. Or, give us a call, we’d be happy to talk about how we leverage Sage ACT! E-marketing. 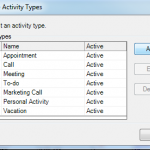 Beyond Meetings, Calls & Todo’s Your Virtual Assistant – ACT!